Celtic Birthstones are assigned based on a lunar calendar devised by the Druids which consists of 13 equal months of 28 days plus one additional day. This day is known as the 'Nameless Day' and falls between the 22nd December and 24th December. Based mainly on natural and supernatural energies the Druids identified the onths with spirits or dryads believed to have been dwelling in the ancient trees. Druids believed that the trees had been given spirits and attributes by the sun which was seen as a symbol of the Supreme Being. Considered living entities by the Druids the trees were thought to possess Infinite Knowledge and Wisdom. A tree was eventually assigned to each phase of the moon in accordance with its magical properties. The table includes the tree for each time period, along with the Gaelic name and the stone that rules it. These are some of the styles that influence the jewellery that is currently being designed and sold in the marketplace. Some of the styles overlap in time while some are still being developed today. ART DECO The geometric style that succeeded Edwardian jewellery inspired by the French "Art Decoratif" movement, from the 1920's and 30's. Zigzags and sharp angles rather than the curves of the Art Nouveau era characterized this style. Coloured stones were utilized more, and the opaque stones such as jade, onyx and coral were set in geometric shapes. Sleek animals such as Borzoi and Greyhound dogs were featured in some designs. The style started out with relatively delicate designs but more geometric and angular than the previous Edwardian style and progressed to more the more bold and blocky style also called Art Moderne. ART NOUVEAU A flowing style of jewellery with sinuous curves and naturalistic motifs produced mainly from 1890s - 1915. It typically has flowing lines and highly stylised depiction's of floral motifs, beautiful women, and fantasy creations inspired by nature. A common motif was a women's head with flowing hair. The name is derived from La Maison de l'Art Nouveau, a gallery for interior design that was opened in Paris in 1895 by Japanese art collector Siegfried Bing (later called Samuel Bing). While partly inspired by Japanese art, which was changing the western attitude to Art, Art Nouveau was also influenced by Celtic, Gothic and Rococo art forms and was a reaction against the academic schools that continued to differentiate between "lower applied and decorative art forms" and "higher fine arts". ARTS & CRAFTS A design movement that began in the late 1800s as a rebellion against the mass-produced, machine made designs of questionable aesthetic value common in the late Victorian era. The designers felt that their work should look handmade, and therefore they often left hammer marks on the piece. Although pieces were made of gold, silver was more commonly used to emphasize the craftsmanship of the piece rather than the intrinsic value of the components. Stones were commonly less expensive cabochon stones such as moonstone, mother of pearl, agates or amber. Enamel work was also used. CELTIC This style is derived from the myths and legends of the Celtic Races. Visual punning and metamorphosis are common: the eye is tricked into seeing a number of animals or faces if the object is turned or the patterns allowed to dissolve and reform themselves into different configurations. Geometry and numbers are the bedrock of Celtic art. The circle and the number 3 are particularly significant. Underlying all of this art is a deep appreciation of the potential for natural forms - leaves, animals, and faces - to shape the Celtic ideas of beauty or good taste. BOLT RING The basic type of fastening for a necklace or bracelet consisting of a hollow loop with an internal spring operated catch, which is retracted to allow a link at the other end of the chain to be inserted, then released to fasten the chain. Because of the circular design and the relatively weak area where the inner portion of the clasp retracts into the hollow circle, the inner part has a tendency to break or bend if too much strain is put on them. LOBSTER CLASP Also known as "trigger" or "swivel" clasps, lobster clasps are some of the most common options for closing necklaces and chains. These closures are typically ovals, but they can be other shapes as well. To operate the clasp, you pull back a tiny metal trigger. The trigger opens the clasp, allowing a link at the other end of the chain to be inserted. Lobster clasps are named as such because of their "pinching" mechanism, and they are often shaped like a lobster's claw. The swivel variant comes with a swivel which allows the design to twist 360 degrees while the clasp stays in place. BAGUETTE A rectangular-shaped stone with rows of step-like facets. If the Baguette's two long sides taper inward, it is called a Tapered Baguette. Baguettes in long, thin cut rectangles are often used as enhancements to a larger centre stone, or on a watch bezel. BRILLIANT-CUT Brilliant cuts are scientifically found to reflect the most light from within the stone, and often are considered to have the most brilliance of all cuts. A round brilliant-cut diamond has 58 facets. Other brilliant cuts include the heart, oval, marquise and pear shaped. CABOCHON A cabochon is a stone cut in a facet-less style of cutting that produces a smooth surface. They can be in many shapes, from round with high domes to squares. FACETS A Facet is the small polished surface of a muti-faceted Gemstone. This style of cutting gives the stone many small faces at varying angles to one another. The placement, angle and shape of each facet are carefully planned and executed to show the stone's inherent beauty, fire, color, and brilliance to the fullest advantage. GIRDLE The girdle is the widest perimeter of a gemstone and the dividing line between the crown and the pavilion. Ideally the width of the girdle should be even and proportional to the cut of the stone. It can be either polished or un-polished. STEP-CUT Is a cut with rows of facets that resemble the steps of a staircase. The Emerald Cut and the Baguette are examples of the step cut. BEZEL SETTING Bezel Settings hold the gemstone by surrounding it with a band of metal, slightly shaped over the top of the girdle, thus securing the gem. They are often used in mens' jewellery, and for softer or more fragile gemstones and have been used to hold gemstones in rings since approximately the 10th Century and are sometimes referred to as collet settings or rub-over settings. CHANNEL SETTING A Channel Setting is where the gems (often Diamonds, Rubies or Sapphires) rest in a channel and are only secured by a slight rim which runs the length of the channel. This style can only be used for gemstones that are faceted to precise dimensions (precision cut), as they all need to be of identical size in order to sit firmly in the channel and the gemstones are normally round cut, square cut or baguette cut. CLAW SETTING Claw Settings, or Prong Settings are the easiest method of setting a gemstone and is probably the most popular setting. A small amount of metal is used to make up claw settings, allowing the optimum amount of light to pass through the stone, maximising its brilliance, and also easy access to the stone for cleaning. Claw settings are made up of prongs, which are used when bent over the stone to secure in place. There are usually four or six "claws" of metal that reach around the gem's girdle to hold it in place. Although the pieces of metal on show can be carved or be made into creative shapes, they are usually rounded to prevent catching. PAVÉ SETTING Pavé Setting is used to describe a setting where gems are set very close together and are only separated by tiny prongs or metal beads. Typically the stones are so close together that one bead can capture two stones, while in the corners individual beads frame the setting. More elaborate styles of pavé feature stones that are farther apart and require individual beads, plus ornamental beads to fill spaces between the stones. The word pavé comes from the French word for paved, like a road is paved with bricks. TENSION SETTING A Tension Setting holds the gemstone in place entirely by pressure rather than prongs, a bezel or other mounting. The metal setting is actually spring-loaded to exert pressure onto the gemstone, and tiny etchings/grooves are added to the metal in order to create a shelf for the gemstone's edges to rest. The gemstone appears to be suspended in the air with nothing holding it in place. Because tension settings place such pressure on the stone, only four types of gemstone can be placed in a tension setting safely (diamonds, rubies, moissanite, and sapphires) and a gemstone that either has significant inclusions or is too soft will fracture under the intense pressure of the setting. A tension setting actually holds the stone in place by compression (a pressing force) and not tension (a pulling force). AMETHYST Amethyst is the purple variety of quartz (SiO2), containing an impurity of iron, which gives the violet color to the mineral. In popular belief, Amethyst offers protection against drunkenness, the name derives from Greek 'amethystos' meaning 'not intoxicated', which is why wine goblets were often carved from it. 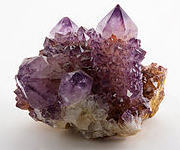 Medieval European soldiers wore Amethyst amulets as protection in battle - the reason for this being that Amethysts are believed to heal people and keep them cool-headed. It was also thought to put the wearer in a chaste frame of mind and symbolise trust and piety, thus Amethysts came to occupy a very prominent position in the ornaments of the Catholic clergy over the centuries. It was the stone of bishops and cardinals and was used on prelates' crosses and rings. AQUAMARINE Aquamarine is the blue to blue-green variety of beryl (beryllium aluminium cyclosilicate) (Be3Al2(SiO3)6, containing an impurity of iron (Fe2+) which gives the blue colour to the mineral. The name derives from the Latin 'aqua marina' meaning 'water of the sea' and it was said to calm waves and keep sailors safe at sea. In Medieval times, the stone was thought to reawaken the love of married couples. It was also believed to render soldiers invincible. It was also believed to be an antidote for poison. EMERALD Emerald is the green variety of beryl (beryllium aluminium cyclosilicate) (Be3Al2(SiO3)6 colored by trace amounts of chromium (Cr3+) and sometimes vanadium. JASPER Jasper is an opaque form of Chalcedony, which is a microcrystalline variety of the mineral Quartz. (SiO2) with mineral impurities dictating the colors of the stone. It can occur in many different colors such as red, green, yellow or rarely, blue. Red-brown Jasper is typically colored by the presence of iron. Jasper is mentioned in the bible and is a well known stone since antiquity, and was once regarded as a very valuable stone. PERIDOT Peridot is the gem variety of the mineral Olivine. It's chemical composition is (Mg, Fe)2SiO4, with Mg in greater quantities than Fe. TURQUOISE Turquoise is an opaque, blue-to-green mineral that is a hydrous phosphate of copper and aluminium, with the chemical formula CuAl6(PO4)4(OH)8·4H2O. It has been prized since ancient times and used as a decorative stone and gem. Archaeological excavations revealed that the rulers of ancient Egypt adorned themselves with turquoise jewellery, and Chinese artisans were carving it more than 3,000 years ago. Turquoise is the national gem of Tibet, and has long been considered a stone that guarantees health, good fortune, and protection from evil. Turquoise's name comes from the French expression pierre tourques, or "Turkish stone". The name, which originated in the thirteenth century, reflects the fact that it probably first arrived in Europe from Turkish sources. In the USA Turquoise was a ceremonial gem and a medium of exchange for Native American tribes in the southwestern US. They also used it in their jewellery and amulets. The Apaches believed that turquoise attached to a bow or firearm increased a hunter's or warrior's accuracy. HANDBLOWN GLASS The Glassblowing technique which was invented by the Phoenicians around 50 B.C. The tip of the blowpipe is first preheated then dipped into molten glass in a furnace. The glass is 'gathered' on to the blowpipe. The glass is then rolled on a marver, traditionally a slab of marble, but is more commonly a fairly thick flat sheet of steel today. This forms a cool skin on the exterior of the molten glass and shapes it. Then air is blown through the pipe to create a bubble. Then, one can gather over that bubble again to create a larger piece. A variety of tools including molds are then used to shape the glass. As the glass cools it begins to stiffen and must be continuously reheated to allow shaping and reshaping. The glassblower uses a smaller furnace, a "glory hole" for the re-heats. When the piece is finished, it is placed in an kiln for annealing. This is the process of slowly cooling the glass to room emperature to stabilize its delicate crystalline structure. Rapid temperature changes will cause the glass to crack. Patterns and color can be applied by rolling the molten glass in powdered color or larger pieces of colored glass called frit. Complex patterns can be created through the use of rods of colored glass known as canes, or with murrine (rods cut in cross-sections to reveal patterns). The main constituent of practically all glass is sand which by itself can be fused to produce glass at temperature of about 1700°C. Adding other minerals and chemicals to sand can considerably reduce the melting temperature and provide different chemical and physical properties. BOROSILICATE GLASS Borosilicate glass is a heat-resisting glass, better known in the UK as Pyrex™. It is made mainly of 70-80% silica (SiO2) and 7-13% boric oxide (B2O3) with smaller amounts of the alkalis (sodium oxide (Na2O) and potassium oxide (K2O)) and aluminium oxide Al2O3). This type of glass has a relatively low alkali content and consequently has good chemical durability and thermal shock resistance (it doesn't break when changing temperature quickly). As a result it is widely used in the chemical industry, for laboratory apparatus, for ampoules and other pharmaceutical containers, for various high intensity lighting applications and as glass fibres for textile and plastic reinforcement. DICHROIC GLASS Dichroic glass is glass containing multiple micro-layers of metal oxides which cause visible light to be split up into distinct beams of different colours or to absorb light with different polarizations by different amounts. The earliest known example of an object made with Dichroic glass is The Lycurgus Cup, a 4th century AD cup probably made in Rome and now exhibited in the British Museum. LEAD GLASS Commonly known as lead crystal, lead glass is used to make a wide variety of decorative glass objects. It is made by replacing the calcium oxide in Soda-Lime Glass with lead oxide and most of or all of the sodium oxide with potassium oxide. The traditional English full lead crystal contains at least 30% lead oxide (PbO) but any glass containing at least 24% lead oxide can be described as lead crystal. Glass containing less than 24% lead oxide, is known simply as crystal glass. The lead is locked into the chemical structure of the glass so there is no risk to human health. Lead glass has a high refractive index making it sparkle brightly and a relatively soft surface so that it is easy to decorate by grinding, cutting and engraving which highlights the crystal's brilliance making it popular for glasses, decanters and other decorative objects. SODA-LIME GLASS By adding limestone to the Water Glass components, chemicals like calcium oxide (CaO) and magnesium oxide (MgO) are added which result in a pure inert colourless glass freely able to transmit light. Other chemicals are added to produce different properties and colours of glass. Most Soda-Lime Glass has a composition of 70% - 74% silica (SiO2), 12% - 16% sodium oxide (Na2O), 5% - 11% calcium oxide (CaO), 1% - 3% magnesium oxide (MgO) and 1% - 3% aluminium oxide (Al2O3). WATER GLASS The addition of sodium carbonate (Na2CO3), known as soda ash, to sand will produce a mixture of 75% silica (SiO2) and 25% of sodium oxide (Na2O). This will reduce the temperature of fusion of the glass to about 800°C. However, a glass of this composition is water-soluble hence its name. ENGINE TURNING Engine Turning is the process where a metal surface is textured by engraving, stamping or chiselling using an engine-turning lathe or stepping drill press. This results in the metal background and the pattern over it being extremely regular and precise, predominantly in radiating patterns of sunburst and rosette design or linear patterns such as moiré silk and wave design. The patterns catch the light and reflect moving wedges as the item or the viewer moves. In industry engine turned products can be use because they tend to reduce glare or hold oil on surfaces. ROLLED GOLD Rolled gold is a very thin sheet of gold alloy that is laminated to both sides of a base metal alloy (usually brass). The layers of metal are heated under pressure to fuse them together. The sheet is then rolled until it was thinned down to the desired thickness. The item is then punched out or cut from the sheet and the bare edge covered and then used to make jewellery or other object. Rolled Gold wire is also made in a similar way with the core a base metal alloy (usually brass) and rolled or drawn to get the desired diameter. AKOYA PEARLS The akoya pearl is a saltwater cultured pearl from the akoya oyster (Pinctada fucata martensii). The oysters are nucleated with a bead composed of mother-of-pearl and a small piece of mantle tissue. This bead becomes the nucleus of the pearl and is the reason akoya pearls are more often perfectly round. This shape, combined with the high-luster found on top-quality akoya pearls, and their relative rarity compared to freshwater pearls, give akoya pearls a higher perceived value. Akoya pearls are currently being harvested in sizes from as small as 1 mm up to the very rare 10-11 mm. They are never naturally black – black akoya pearls have undergone either Cobalt-60 radiation treatment or treatment with an organic dye. While the vast majority of the world's akoya pearls are produced in Japan they are also currently farmed in China and to a lesser extent, Vietnam, Thailand and Australia. Baroque pearls are pearls with an irregular non-spherical shape. Shapes can range from minor aberrations to distinctly ovoid, curved, pinch, or lumpy shapes. Most cultured freshwater pearls are baroque because freshwater pearls are mantle-tissue nucleated instead of bead nucleated. They were highly prized by Renaissance jewelers, who saw them not as misshapen products of sea mollusks but rather as unique and exquisite natural forms. They were often used in pieces of jewelry to form the bodies of figures. A superb example is a piece from the 16th century known as the Canning Jewel, exhibited in the Victoria and Albert Museum, in which a large baroque pearl is used for the torso of a sea figure having the body of a man and the tail of a fish, the whole mounted in enameled gold set with pearls, rubies, and diamonds. BLACK PEARLS Black pearls are formed from the Tahitian black-lipped oyster (Pinctada margaritifera). When culturing a Tahitian pearl, technicians insert a small square of donor mantle tissue with a mother of pearl shell bead. Mantle tissue will influence the pearl's color; depending on colours present in the shell of the donor mollusk. They have a dark body colour, usually green, blue purple or gray. Most black Tahitian pearls will be untreated and show some natural variation in colour, while treated pearls tend to be far more uniform in colour. Vitreous Enamel is a glassy substance (powdered glass with colorants) fused normally onto metal using heat (see basse taille, cloisonné, hamplevé, guilloche, and plique à jour). Several layers of enamel may be fired in succession. The enamels may be translucent or opaque. BASSE TAILLE Basse taille is a type of enamelling in which translucent enamel (powdered glass with colorants) is applied over a metal surface that has been textured by etching, engraving, stamping or chiselling by hand. This results in the metal background and the pattern over it being seen through the translucent enamel. GUILLOCHÉ Guilloché refers to the process of preparing the metal surface for this type of enamelling in which translucent enamel (powdered glass with colorants) is applied over a metal surface that has been textured by engraving, stamping or chiselling using an engine-turning lathe. This results in the metal background and the pattern over it which is extremely regular and precise, predominantly in radiating patterns of sunburst and rosette design or linear patterns such as moiré silk and wave design, being seen through the translucent enamel. PLIQUE À JOUR Plique à jour is a back-less enamel that is a bit like stained glass. In plique à jour, the enamel work is translucent (light shows through it) since the backing of the enamel is absent. Cells of enamel are surrounded by delicate wire. Plique à jour is made by shaping cloisonné wire on a thin sheet of metal (or mica) that will not bond to the enamel. Enamel (powdered glass with colorants) is fired into the wire cells. After the enamel has melted and cooled, the backing (metal or mica) is peeled away or may be etched away and the translucent enamel is left suspended in a supporting framework of cloisonné wire. GRAIN One of the earliest units of weight standardized in 1233 by Henry III. One grain being the equivalent of one grain of barley. It was found that 32 grains of dry wheat taken from the middle of the ear weighed the same as 24 grains of barley and barley was easier to obtain. PENNYWEIGHT One of the earliest units of weight standardized in 1233 by Henry III. One pennyweight being the equivalent of 32 grains of dry wheat taken from the middle of the ear. This was also the nominal weight of silver in an English silver penny of that time. TROY Troy is a weight system for measuring precious metals and precious stones. The Troy pound (5760 grains) is divided into 12 Troy ounces. It is possibly named after a weight used at the annual fair at Troyes in France in the Middle Ages.